Sen. Kirsten Gillibrand is taking steps toward a 2020 presidential bid. Democratic Sen. Kirsten Gillibrand is taking steps toward a 2020 presidential bid. Gillibrand is the third woman to throw her hat in the ring for president. Rep. Tulsi Gabbard of Hawaii and Sen. Elizabeth Warren of Massachusetts have taken steps toward a 2020 run in recent days. Once considered a moderate Democrat, Gillibrand was first elected to Congress in 2006 and represented a rural Republican district in upstate New York. In 2009, she was appointed to finish then-senator Hillary Clinton’s term when former President Barack Obama nominated her as secretary of State. Gillibrand has used her time in the Senate to push a more left-leaning agenda. In 2010 she championed the repeal of “Don’t Ask Don’t Tell” policy that banned gay men and lesbians from serving in the military. Over the past couple of years, she has opposed President Donald Trump’s nominees for his cabinet and other senior government roles including voting against Justice Brett Kavanaugh’s confirmation to the Supreme Court. (Mary Altaffer/AP) Sen. Kirsten Gillibrand, speaks to supporters during an election night watch party hosted by the New York State Democratic Committee, Nov. 6, 2018, in New York, after being re-elected. Gillibrand’s team paints her as a candidate that can reach across the aisle and be a unifying voice. A campaign official lauded her electoral victories where she earned more than half of the votes in predominantly rural counties that voted for Trump in 2016. 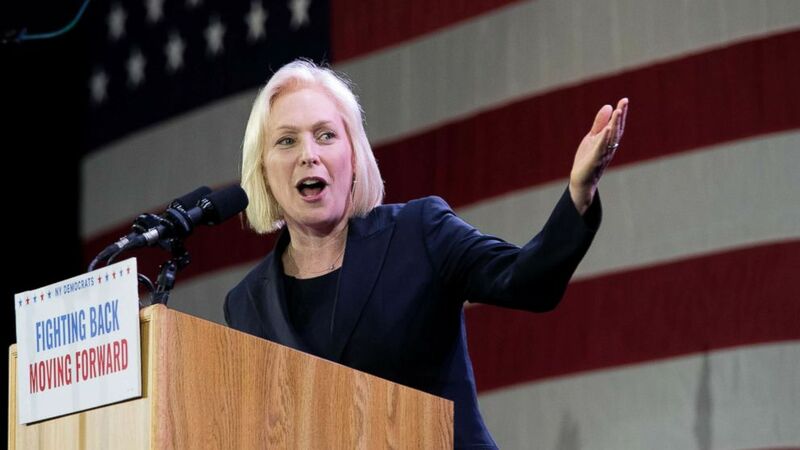 During her most recent re-election bid in 2018, Gillibrand denied having presidential ambitions. In a debate hosted by ABC News affiliate WABC-TV Republican opponent, Chele Farley cited out of state trips, including one to New Hampshire, as proof that she was thinking of running. But a week after her successful re-election, she said on ABC’s “The View” that she was considering a 2020 run. “But that’s a very important moral question that I’ve been thinking about ... what president is putting into this country is so disturbing, so divisive, so dark, that I believe I’ve been called to fight as hard as I possibly can to restore that moral integrity, that moral decency. So I’m thinking about it,” she said.